Whether you’re building a brand new home or are overseeing construction of a commercial structure, having a reputable, knowledgeable HVAC contractor on your team is crucial. After all, comfort system performance is a vital for creating a welcoming indoor environment. If it’s time to find a construction HVAC contractor with years of expertise, look no further than Shackelford Heating & Cooling. At Shackelford, our team of new construction HVAC pros has been serving the Madison area and surrounding counties since 1986. As a Carrier Factory Authorized Dealer, we’ve demonstrated not only our HVAC expertise, but also our commitment to customer satisfaction. Our customer-first philosophy has earned us a reputation for quality in Wisconsin and our NATE-certified technicians are some of the best trained in the industry. HVAC design may not be the first thing you think of when building a new home, but it’s going to have a lasting impact on your family’s comfort – and utility bills. That’s why our new construction HVAC experts will work directly with you to design and install a system that’s meant to fit your new home’s needs perfectly. 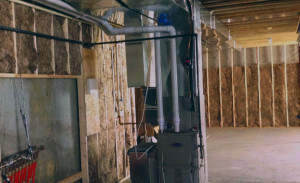 We’ll also work in conjunction with your general contractor to schedule installation of your new system and ensure that it’s ready to go when you’re ready to move in.